St. Martin's Press, 9781250069191, 256pp. Every little kid who's ever taken the mound in Little League dreams of someday getting the ball for Game Seven of the World Series. Ron Darling got to live that dream - only it didn't go exactly as planned. 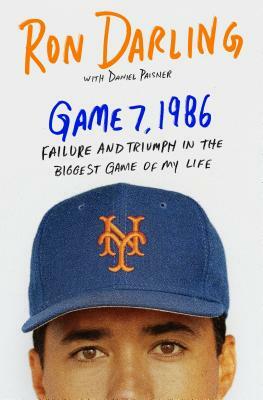 In New York Times bestselling Game 7, 1986, the award-winning baseball analyst looks back at what might have been a signature moment in his career, and reflects on the ways professional athletes must sometimes shoulder a personal disappointment as their teams find a way to win. Published to coincide with the 30th anniversary of the 1986 New York Mets championship season, Darling's book will break down one of baseball's great "forgotten" games - a game that stands as a thrilling, telling, and tantalizing exclamation point to one of the best-remembered seasons in Major League Baseball history. Working once again with New York Times best-selling collaborator Daniel Paisner, who teamed with the former All-Star pitcher on his acclaimed 2009 memoir, "The Complete Game," Darling offers a book for the thinking baseball fan, a chance to reflect on what it means to compete at the game's highest level, with everything on the line. Ron Darling is a New York Times bestselling author and Emmy Award-winning baseball analyst for TBS, the MLB Network, SNY, and WPIX-TV, and author of The Complete Game. He was a starting pitcher for the New York Mets from 1983 to 1991 and the first Mets pitcher to be awarded a Gold Glove. DANIEL PAISNER has collaborated on many books, including the New York Times bestselling Last Man Down: A Firefighter's Story of Survival and Escape from the World Trade Center.